Way to bomb, dude. Late Night’s Seth Meyers cracked jokes at the Council of Fashion Designers of America (CFDA) Awards, where he served as host. He thought that Trump jokes would make for hysterical material. Not so much. His first joke was a thunderous dud: “Abercrombie & Fitch has announced it’s putting itself up for sale. Meanwhile, thanks to Donald Trump, the United States has become a Banana Republic.” No one laughed or clapped… you could hear a pin drop. Then he turned to an old favorite… Trump’s hair: “It’s harder than ever to separate fashion from politics. First Lady Melania Trump made headlines recently after she decided not to wear a head cover while visiting Saudi Arabia,” he said. “Which was especially shocking, since her husband wears a head covering literally everywhere.” That got moderate laughter, but not what he had hoped for. The worst joke he made was at Ivanka Trump’s expense: “Big year for fashion designer Ivanka Trump,” he said. “I’ve heard her clothes are flying off the shelves in Nordstrom.” Again, dead silence. Tough crowd… they didn’t appreciate political jokes and cheap shots at the Trump family. Imagine that. Awkward doesn’t cover it here. But in-between the jokes about romphims and Balenciaga’s Ikea bag at the New York City gala, known as “fashion’s Oscars” for its high-wattage attendees, the Late Night host included some style-related Trump content in his opening speech, to mixed results from the audience. “Abercrombie & Fitch has announced it’s putting itself up for sale. Meanwhile, thanks to Donald Trump, the United States has become a Banana Republic,” he said, the room staying quiet. This was in New York… so I’m a bit surprised at the tepid response, but it’s a nice surprise. I’m sick of these so-called comedians taking swipes at the First Family. It was old before it ever started. Returning to host the event for the first time since 2012, Meyers mostly stuck to apolitical material for the evening, poking fun at male rompers and Balenciaga’s $2,145 ‘IKEA’ bags. But he just couldn’t stay away from poking the Trump badger and the attendees were not amused. It was revealed in February that Nordstrom had dropped Ivanka Trump’s fashion line due to poor sales. Which was a flat-out lie. It was a political move pure and simple. Ivanka Trump’s line is way up in sales and profits, much to the horror of progressive leftists out there. Though Meyers’ political humor fell flat, the ceremony overall had a strong activist bent this year, reaching outside the fashion industry to honor feminist icon Gloria Steinem, Planned Parenthood’s Cecile Richards and actress Janelle Monae for their involvement in the Women’s March on Washington in January. But it would seem that the political winds are beginning to blow from left to right even in stormy New York. 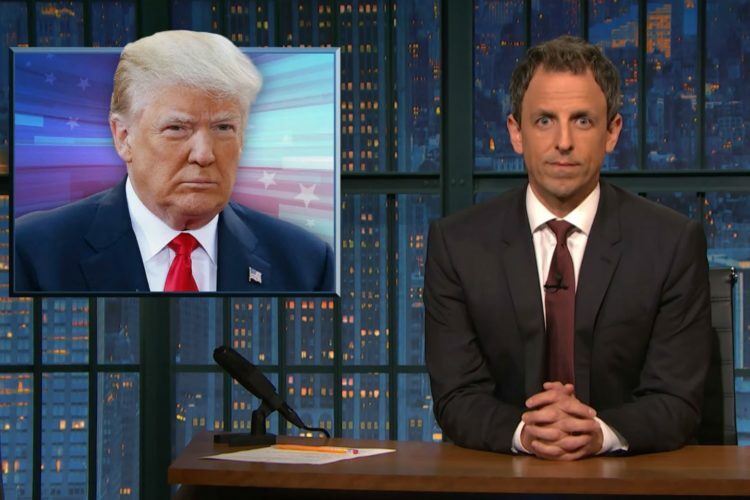 Serves Seth Meyers right… what a hack.